Almost everything is designed in-house, and having one of the largest design teams on the High Street means that they can have fabulous new fashion arriving in-store and online every single week. River Island has 24 stores located in Ireland, and can be found on any major High Street. How it Works: Use this gift voucher on AllGifts.ie to order eGift Cards for use in any River Island store in the Republic of Ireland. Or you can swap this voucher for any other gift or voucher listed on AllGifts.ie. 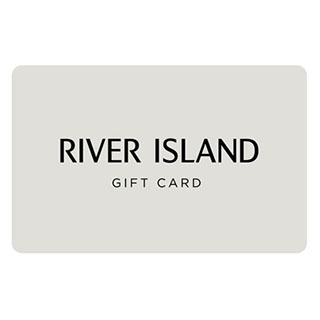 River Island eGift Cards are sent by email once ordered, normally within 3 working days. River Island Vouchers are available in denominations of €10, €25, €50 and €100 (eg. €10, €20, €25, €60, €125 etc). Minimum voucher value is €10.